King Louie shows he's the king of swingers! Mini-bust spotlights The Jungle Book's rowdy orangutan. 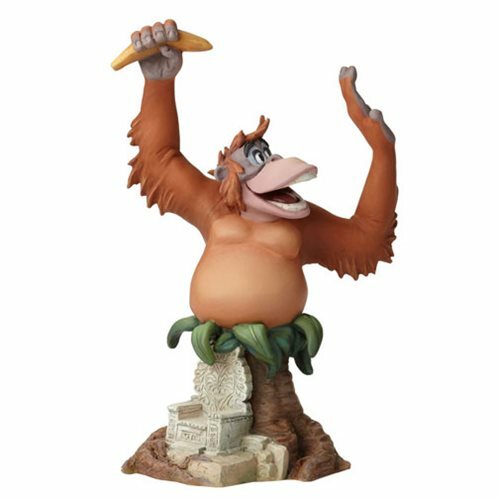 King Louie, The Jungle Book's rowdy orangutan, gets it on in this highly entertaining The Jungle Book King Louie Grand Jester Mini-Bust, proving he truly is the king of swingers. Made of stone resin, this jungle VIP measures about 7 3/4-inches tall x 5-inches wide x 4-inches long. In the movie, after kidnapping Mowgli to learn the secret of "man's red fire," King Louie gives a rousing performance of "I Wanna Be Like You." Ages 13 and up. Stop Looking For The Bare Necessities, We’ve Got Them Right Here!